Teachers often do not receive the appreciation they deserve, and the hard work they do usually goes unnoticed. They work long hours for little pay and receive little praise. They deserve a gift that’s a little different from the rest with our personalized teacher appreciation gifts. These are the best novelty gifts for teachers because of their creativity and uniqueness. They have to be number one on the list of unique Christmas gifts for teachers. Where else are you going to find a watch with a notebook, microscope and ruler on the face! These watches are like no other, and the iconic images make them cute thank you presents for teachers who love what they do. 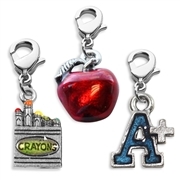 Our teacher-themed jewelry and accessories are truly one of kind and will show that you put a lot of thought and care into the present. Our gifts range from watches to jewelry sets, and each product is handmade to be unique and different. Pick from our wide category below to ensure you find the perfect gift for the teacher making a difference in your child’s life!